Once upon a time.......there was a stag with splendidly long antlers, who was very conceited. Every time he drank at a pool, he would stand and admire his reflection in the water. I am handsome, he would tell himself. There's no finer set of antlers in the forest! And off he would prance. 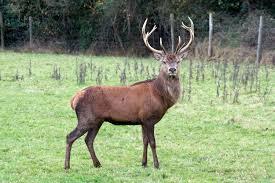 Like all stags, he had long slender legs, but folk said he'd rather break a leg than lose a single branch of his splendid antlers. Poor foolish stag! How vain he was. One day, as he grazed peacefully on the tender shoots on some low branches, he heard a distant shot. He heard with fear the baying of the hounds. Terrified, he knew what terrible enemies the hounds were and that, if they caught his scent, it would not be easy to outrun them. He had to flee, at once and as quickly as possible. Faster and faster he sped along the woodland track, his heart in his mouth. He could hear the baying of the pack at his heels. Without ever looking back, he ran in a straight line, trying to shake off his pursuers. Then the wood thinned out into a clearing. With luck, I'll be safe now, he said to himself running swiftly over the smooth ground. And indeed, the yelping of the hounds seemed to die away in the distance. Only a little further now and the stag would reach safety. Suddenly as he swept under a tree, his antlers caught in the low-hanging branches. He shook his head desperately, trying to break free, but although he struggled, his antlers were held fast. The hounds were coming closer and closer. Just before the stag met his doom, he had time to think: What a mistake I made in regarding my antlers as the best and most precious part of my body. I should have had more respect for my legs. They tried to carry me to safety, while my antlers will be the death of me.